Please see the most recent edition of the FEMEA Newsletter. In this issue, we discuss the Regional Honor Bands for next year, with sites in Tallahassee, Tampa, and Miami. Congratulations 2019 Dorothy Land Grant Winner, Anita Travaglino from Claywell Elementary in Tampa. Her project is titled, "Start 'Em Young, Train 'Em Right", a ukulele program. 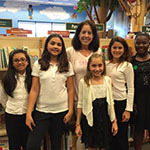 Congratulations to 2019 Janice Lancaster Professional Development Scholarship awardees: Katie Nadolny, Pineapple Cove Classical Academy in Brevard County will be attending Orff Schulwerk Level II at George Mason University in Fairfax, VA. Tara Sperry, Challenger Elementary in Broward County will be attending Orff Schulwerk Level II at Florida International University in Miami, FL. Applications are now open for the Janice Lancaster Professional Development Scholarship and Dorothy Land Grant for music classroom projects. Deadline: March 1, 2019. The advocacy video produced for the All-State concerts is now available to FEMEA members. We encourage you to play it before your concerts and performances for parents. To access, login to your FMEA membership account and then look under "Member Content." The mission of the Florida Elementary Music Educators Association is to unite and support music educators in order to provide a high quality, comprehensive music education for all children.